On August 25 (Saturday), we will be holding a Wire Mesh Origami [Fabric Metals ORIAMI] workshop at Omiya Sonic City. 2018.08.22 On August 25 (Saturday), we will be holding a Wire Mesh Origami [Fabric Metals ORIAMI] workshop at Omiya Sonic City. On August 25 (Saturday), from 1:30 p.m. to 4:00 p.m., we will be holding a Wire Mesh Origami [Fabric Metals ORIAMI] workshop at Omiya Sonic City. During the workshop, participants will create 2 accessories - a "rose" and a "sunflower." 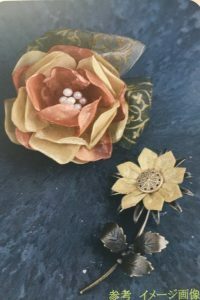 When making a flower, by building detail into each individual petal, you can dramatically change and increase your range of creative expression. Wouldn't you like to receive the careful and thoughtful guidance of an ORIAMI Art Club Instructor, and learn a higher level of techniques? This workshop is filled with valuable information and skills. Please take advantage of this opportunity! Date: August 25 (Saturday), 1:30 p.m. - 4:00 p.m.